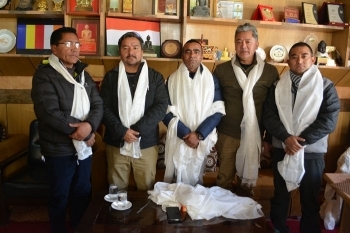 The General body meeting of Ladakh Buddhist Association to elect the new office bearers for the year 2018-20 was held on December 6 at Chowkhang Vihara, Leh. Tsewang Thinles was re-elected unanimously as the President whereas, PT Kunzang and Rinchen Namgyal were elected as Vice president. Sonam Dawa and Tsering Angchuk were elected as General and Joint Secretary respectively. He further stressed the need for all communities to come on one platform to sort out matters and issues in order to maintain and keep the bond of all community strong and cordial. LBA Youth and women wing will be formed in the month of December.